Roller Games International (RGI) was a branch of roller derby that existed from 1960 to the mid 1990s. Founded by Bill Griffiths, Sr., Roller Games was created after a group of players stayed in Los Angeles after the Selzter family moved the Roller Derby base of operations to the San Francisco Bay Area, choosing to develop a more theatrical, “colorful” version of the game for audiences. RGI began as one team, the Los Angeles Thunderbirds, but quickly expanded to six within the United States, and then further expanded with international affiliates in Canada, Mexico, Australia, and Japan. (The Japanese arm of the RGI would eventually become Roller Game Japan.) The “World-Famous, World-Champion” T-Birds would often tour the country and the world under the Roller Games International banner. In 1989, a syndicated roller derby television show was created using RGI assets. 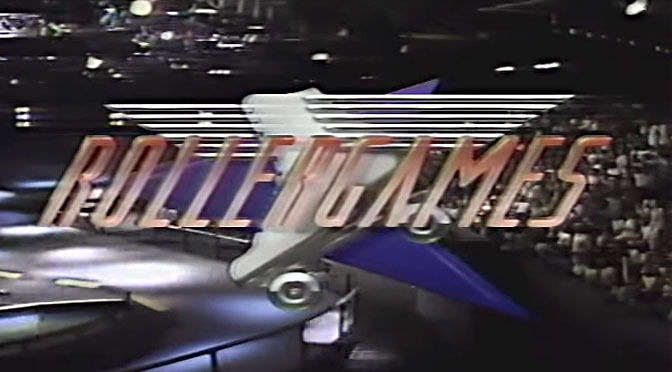 Called Rollergames, the show featured a one-of-a-kind figure-8 track with a jump, the steeply-banked “Wall of Death,” and an alligator pit used during “sudden death” to break ties. While the show was immensely popular with audiences, it only lasted a season when the show distributor went bankrupt. Get 80 years of roller derby history and game theory in 80 minutes. An Another Derby Series extra: Music to wrestle alligators by.